Cordless Pre-lit Cone & Berry Christmas Wreath. No cords or outlets needed, so you can decorate anywhere! 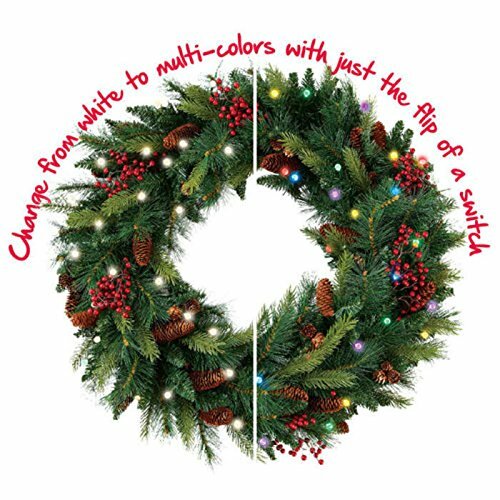 Made with lifelike greens and dotted with realistic cones and berries Pre-lit with LED bulbs Choose multi-color, warm white, or dual lights (switch between multi and warm white) Built-in timer turns lights on for 6 hours, off for 18 hours Safe for both indoor and outdoor use Perfect for doorways, windows, mantels, banisters, and more No plug? No problem! Our beautiful Cone & Berry Wreaths with battery-operated lights make holiday decorating a joy. Hang multiple wreaths on your porch for a welcoming covered outdoor display, or hang indoors to bring holiday cheer to any room or hallway. The greens, berries, and pine cones are all so lifelike, your holiday guests are sure to be impressed. A built-in timer automatically turns the lights on for 6 hours and off for 18 hours, making it truly effortless. 24-inch Wreath specs: Dimensions: 24" x 24" x 4.25" (61 x 61 x 11.43 cm) Weight: 4 lbs (1.8kg) Lights: 30 LED bulbs Power: 3 D batteries (not included) 30-inch Wreath specs: Dimensions: 30" x 30" x 4.5" (76.2 x 76.2 x 12.7 cm) Weight: 5.5 lbs. (2.49 kg) Lights: 40 LED bulbs Power: 3 D batteries (not included) 36-inch Wreath specs: Dimensions: 36"" x 36" x 5.5" (91.4 x 91.4 x 13.97 cm) Weight: 9 lbs. (4.08 kg) Lights: 50 LED bulbs Power: 3 D batteries (not included) 48-inch Wreath specs: Dimensions: 48" x 48" x 5.5" (121.9 x 121.9 x 13.97 cm) Weight: 16 lbs. (7.25 kg) Lights: 80 LED bulbs Power: 3 D batteries (not included) Make your home merry and bright in a fraction of the time--order a Cordless Pre-Lit LED Cone & Berry Wreath from Brookstone today! NOTE: Product dimensions are measured at its fullest extension from tip to tip. Upon receipt and unboxing, we recommend taking a few minutes to gently fluff the wreath to achieve desired fullness. If you have any questions about this product by Brookstone, contact us by completing and submitting the form below. If you are looking for a specif part number, please include it with your message.